Wild giant pandas in China are doing well. The latest census by China's State Forestry Administration shows the panda population has grown by 268. The total is 1,864. The last survey ended in 2003. Nearly three quarters of the pandas live in the southwestern province of Sichuan. 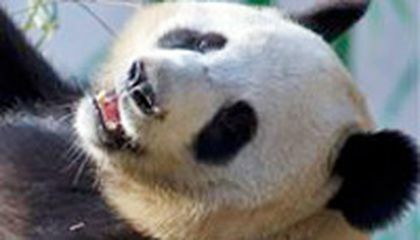 The remaining pandas have been found in the neighboring Shaanxi and Gansu provinces. "The rise in the population of wild giant pandas is a victory for conservation and definitely one to celebrate," said Ginette Hemley. She is senior vice president of wildlife conservation for World Wildlife Fund. Hemley credits efforts by the Chinese government for the increase. The survey shows 1,246 wild giant pandas live within nature reserves. There are 67 panda reserves in China. That is an increase of 27 since the last survey. "The survey result demonstrates the effectiveness of nature reserves in boosting wild giant panda numbers," said Xiaohai Liu, executive program director for WWF-China. But the survey also points to economic development as a main threat to the rare animal. It says 319 hydropower stations and 832 miles of roads have been built in the giant panda's habitat. WWF said it is the first time that large-scale infrastructure projects such as mining and railroads get referenced in the survey. Traditional threats such as poaching are on the decline, WWF noted. China began surveying its giant pandas in the 1970s. The latest census began in 2011. It took three years to complete. The number of giant pandas in captivity grew by 211. That is more than double the previous survey figure, according to the census. Critical thinking challenge: Why is it important for China to count its pandas? Was the dress black and blue or gold and white? That is cool I didn't know there was so few pandas in the world. I like pandas they look cool but I would hate to get to close to one. I think people should stop building on pandas land to try and preserve pandas for the future to come. I think pandas are beautiful amazing creatures that deserve life. Oh that's cool I did not know that there where so many panda's in the world but they are so rarely seen by people endless you work with them. Those little bamboo eaters are so cute. i hope they grow by number and cuteness. Why dont they eat normal bear stuff? they are bears, right? I'm really glad that pandas numbers are increasing and that china takes the time to find out how many pandas there are. Panda were once in danger but now we are gaining them every year I just hope chine doesn't let us over populate. 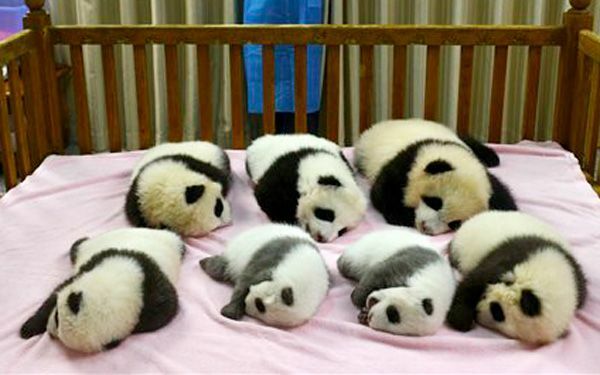 These Chinese super cute baby pandas are super cute. I'm really glad they are functioning and almost ready for the real world zoo with many adoring fans. I learned in the selection above that there were 268 pandas born since the last population survey, making the population grow to 1864 pandas, and the last survey was in 2003. This was a really interesting article to read. I hope that they keep trying to protect these pandas so that they are always on this earth! I learned that wild giant pandas in China are doing well and the panda population has grown by 268. Also there are 67 reserves pandas in China.